The schedule allows you to add multiple therapists and rooms, but also allows you to offer all your treatments in one schedule. That way your clients can simply choose and make the reservation. Always be in touchNo more playing phone tag to schedule appointments. With the automated system doing that for you, you save a lot of time. And clients like the convenience too, especially the ability to book appointments outside the opening hours. Custom forms allow you to get the info you needYou can collect extra information from every client by adding a form to the schedule. That form can be used to let your clients describe their complications, treatment history or their desired treatment. Add additional treatments and extrasYou can add all your treatments in the schedule, for instance, by adding a drop down menu. Your clients can then choose their desired treatment from the list and create their appointment. Freedom to collect payments your wayYou can offer your clients a couple of payment options. You can let them pay online for example with PayPal or credit card, but you can also offer to have it done manually through a bank transfer. SuperSaaS is easy to configure, offers a customizable layout and colors to the driven client experience when booking. As a therapist, I can easily accept online appointments and my patients can easily book a time convenient to them. My clients highly appreciate having this ability. The ability to customize every aspect of my calendar and create booking rules for corporate chair massage bookings is amazing. 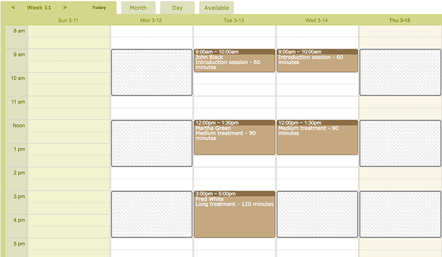 I love the ability to see the schedule (versus only seeing available times to book) from the client side. The system works well for someone seeking a software that accepts online bookings and collects payments. This is a great stand-alone product for scheduling.